Jacobson and Chubak Endodontics (New York) - Book Appointment Online! 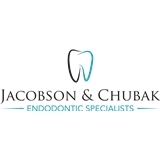 Jacobson and Chubak Endodontics is a boutique endodontics practice located in Midtown of Manhattan. The practice is limited to Endodontics - Root canal therapy, Retreatment, and related surgeries such as Apicoectomy. With a focus on biologically based patient care using the latest technologies, we aim to treat each patient with the most up to date and comfortable care. The office is all digital, digital x-rays, has a 3-D ConeBeam CT Scanner, and all patients are treated with magnification using the Dental Operating Microscope. We use the latest in rotary and reciprocating instrumentation, including WaveOne, Protaper-Gold, Protaper-Next, ESX, and others. We know that root canal therapy and related surgeries can be scary to most patients and we aim to change your misconceptions with an experience that is comfortable, caring, and pain free/alleviating. Please do not book checkups, cleanings, fillings, crowns - we do not perform those services. If you do not see the availability you would like in the schedule below please contact the office directly. Very friendly professional staff. Made a great experience out of a less than ideal situation. I would recommend someone and would go back. I can't thank Dr. David Jacobson enough. I left the office without the answers I was hoping for, but with respect for the complexities inherent in dentistry. Dr. Jacobson and team were very professional and treated me like a person with a brain, less a patient at the mercy of a doctor's orders. They come very highly recommended!